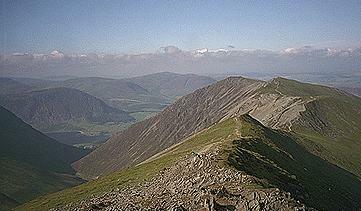 This is a fine ridge from Whiteside to Hopegill Head. The valley of Gasgale is on the left. The northern summit of Mellbreak can be seen beyond Crummock Water with Gavel Fell and Blake Fell to the right. Larger version of this picture.